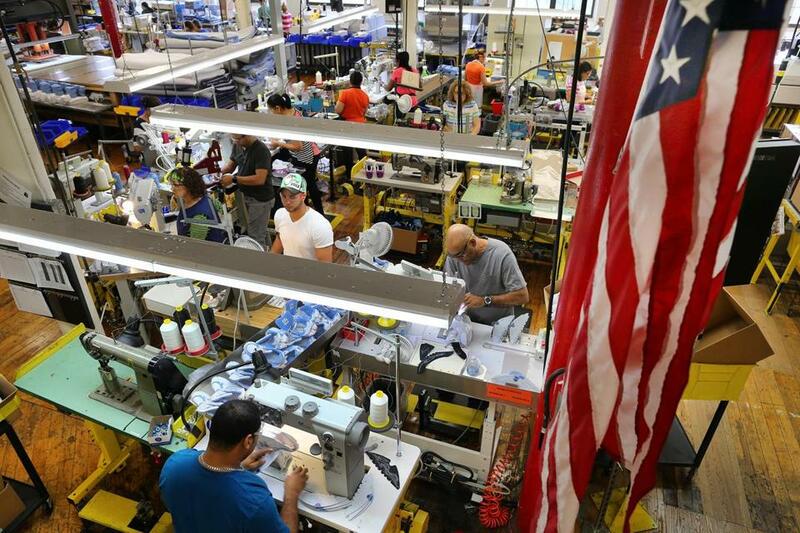 New Balance has several Northeast factories, including in Lawrence. But no order has been placed, and New Balance officials say the Pentagon is intentionally delaying any purchase. New Balance is reviving its fight against the trade deal, which would, in part, gradually phase out tariffs on shoes made in Vietnam. A loss of those tariffs, the company says, would make imports cheaper and jeopardize its factory jobs in New England. The administration has made the pact a priority. It could be voted on by Congress later this year, though possibly not until after the November elections. The administration says the issues of foreign tariffs and of whether the Pentagon should be required to buy shoes made domestically are entirely separate. New Balance disagrees. Though most of the company’s shoes are made overseas, domestic manufacturing is a big priority for owner Jim Davis, a longtime Republican donor. A running shoe is brushed in a final step before boxing them in Lawrence. The company employs about 1,400 people at its five New England factories — one in Brighton, one in Lawrence, and three in Maine. Company officials say they are looking to add workers to those plants, and they see a major military contract, with potentially as many as 200,000 shoe orders a year, as a way to help reach that goal. Nearly every piece of gear that military recruits wear is made in the United States, per a 1940s-era law known as the Berry Amendment. But for many years, athletic shoes were exempt, largely because of a lack of sufficient domestic options. Hoping to change that, New Balance and other companies worked toward making an all-American shoe. New Balance even purchased an expensive machine to make midsoles, a key component that was nearly always made overseas. In 2014, the Pentagon relented. 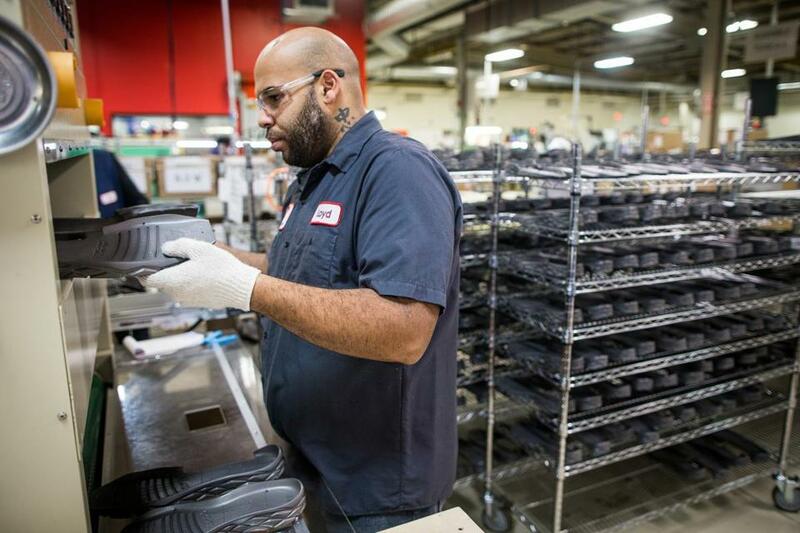 With competition among US manufacturers, officials said they were ready to consider domestically made shoes. LeBretton said a representative for the Obama administration then asked New Balance to accept a compromise version of the trade deal, partly in exchange for a pledge of help getting the Department the Defense to expedite the purchase of US-made shoes. But that help never arrived, LeBretton said. The agency still hasn’t ordered any US-made sneakers. The problem, according to the Department of Defense, is that none of the three New Balance shoes offered for consideration met the agency’s cost requirements and one didn’t meet durability standards. The administration portrays the delay as quality and cost control. But New Balance sees it as foot-dragging, and as reason enough to revive its fight against the Trans-Pacific Partnership. A spokesman for the Office of the US Trade Representative said the Obama administration supports New Balance’s efforts to develop a shoe that’s compliant with the Berry Amendment. He said it is a mistake for the company to use that issue as a reason not to support the separate trade accord. “It is unfortunate that, despite a strong outcome in TPP that advances the interest of US footwear workers, New Balance now appears to be changing its position on TPP in response to the Pentagon’s separate procurement process,” spokesman Matt McAlvanah said in a statement. But like New Balance, Representative Niki Tsongas is tired of waiting for the domestic shoe contract. The Lowell Democrat is trying to include legislation in the next big defense spending bill that would ensure the department’s purchase of US-made shoes for recruits. She is expected to have assistance from members of Maine’s delegation. Wolverine Worldwide, another company looking to build an all-US running shoe for the military, backs the Asia-Pacific deal and will also support Tsongas’s legislation. Spokesman David Costello said Wolverine, whose Saucony brand is based in Lexington, is also frustrated by the delays. Landing a Pentagon contract, he said, could create a positive impact that would ripple throughout Wolverine’s and New Balance’s supply chains and support smaller companies that make components for the shoes. 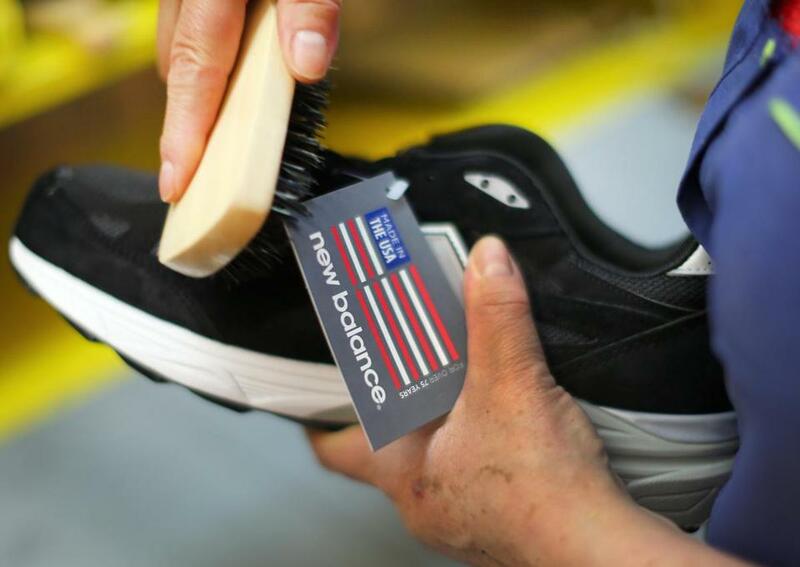 Executives at New Balance recognize that they risk alienating a big potential customer by challenging the US government over the trade agreement. But LeBretton said it’s worth the gamble. Lloyd Johnson placed midsoles into the stabilization tunnel at the New Balance manufacturing plant in Brighton.